Area 18: Download a printable PDF version of this map. Crab 18 Reminder Combined daily limit for Dungeness crab, red rock crab, box crab, Puget Sound king crab and all other king crab is 4. Herring 18 Reminder Harvesting of herring roe from marine plants or plants placed in the water for the purpose of harvesting herring roe is prohibited. Codfish 18 Reminder Species includes: Pacific cod, Pacific tomcod, pollock and hake but does not include lingcod. 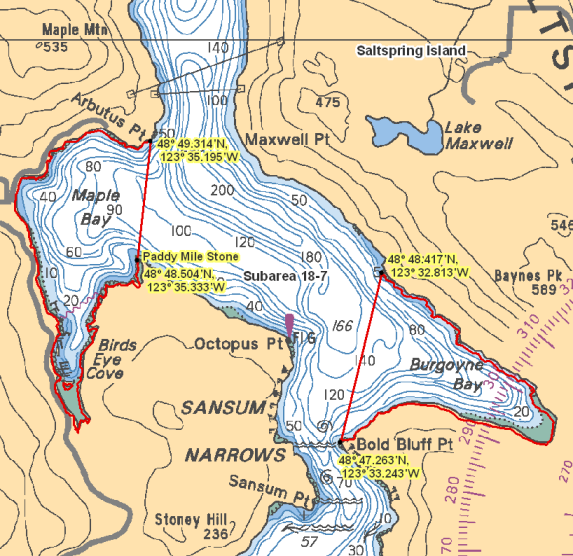 18.18 Unnamed bays E of Fulford Harbour, Saltspring Is. 18 Gear Restriction It is illegal to use any mechanical apparatus or dredge for harvesting clams. Mussels 18 Reminder Combined daily limit for all mussel species is 75. 18 Packaging and Transporting Harvesters are encouraged to shuck oysters on the beach and leave the shells there, or return oyster shells to the beach from where you collected them whenever possible. In order to avoid the transfer of European green crab, please dispose of any oyster shell harvested from the west coast of Vancouver Island back to the beach from where it came or with your household garbage. Consult your local DFO Office. 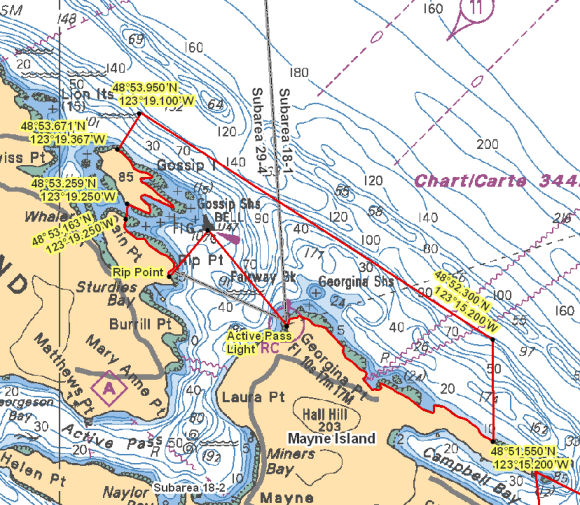 You will need permission to harvest oysters from marked oyster farms. 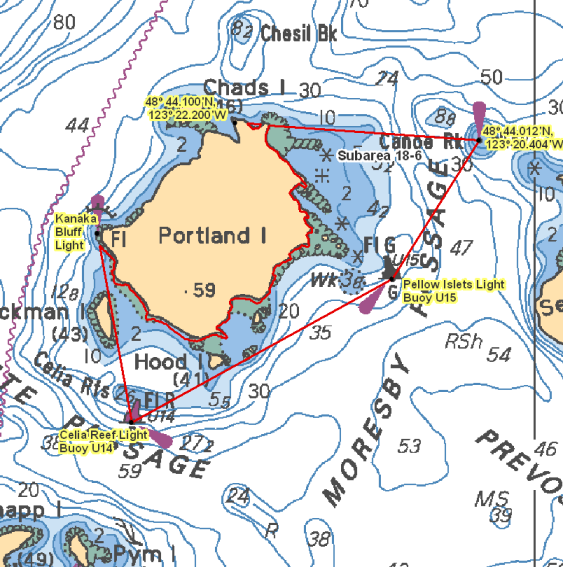 Bell Chain Islets Bell_Chain_Islets.png Those portions of Subareas 18-1 and 18-11 that lie inside a line that: begins at 48°51.309'N 123°14.775'W Edith Point then to 48°49.500'N 123°09.200'W in water then to 48°48.433'N 123°10.000'W Saturna Island then following the northerly shoreline of Saturna Island to 48°48.827'N 123°11.333'W Winter Point then to 48°48.863'N 123°11.351'W Ralph Grey Point then following the northerly shoreline of Samuel Island to 48°50.000'N 123°14.000'W Grainger Point then to 48°50.797'N 123°14.636'W Campbell Point then to the beginning point. Brethour, Domville, Forrest, Gooch Islands Brethour,_Domville,_Forrest,_Gooch_Islands.png Those waters of Subareas 18-6 and 19-5 that lie inside a line that: begins at 48°41.650'N 123°19.978'W Imrie Island then to 48°41.088'N 123°17.622'W Arachne Reef Light then following the boundary line between Subarea 18-6 and 19-5 to the intersection with the International Boundary between the United States and Canada, then following the International Boundary in a southerly direction to the intersection with the parallel passing through 48°39.800' north latitude, then to 48°39.738'N 123°16.551'W Tom Point then to 48°38.989'N 123°18.081'W South Cod Reef Buoy then to 48°39.400'N 123°19.645'W Forrest Island then following the northerly shoreline of Forrest Island to 48°39.963'N 123°20.467'W Forrest Island then to 48°40.865'N 123°20.410'W Greig Island Daybeacon then to the beginning point. 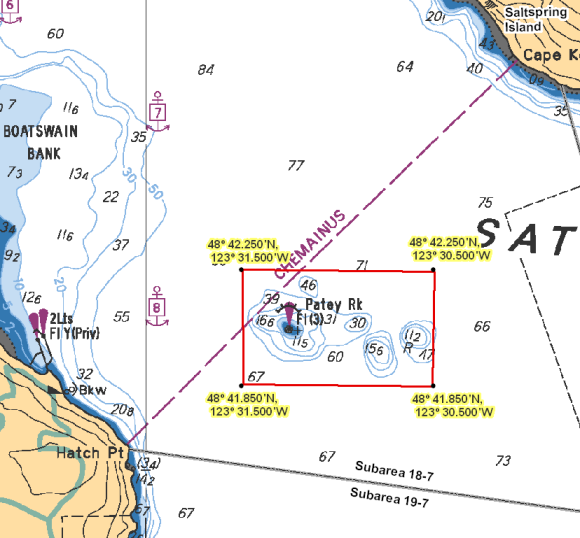 Coal Island Coal_Island.png Those waters of Subareas 18-6 and 19-5 that lie inside a line that: begins at 48°41.278'N 123°24.124'W Swartz Head then to 48°41.474'N 123°23.289'W Fir Cone Point Light then following the westerly shoreline of Coal Island to 48°40.753'N 123°22.626'W west of Kamai Point then to 48°40.232'N 123°22.669'W Little Shell Island then to 48°40.047'N 123°23.859'W Armstrong Point then westerly following the shoreline to 48°40.179'N 123°24.273'W Tsehum Harbour Breakwater then to 48°40.478'N 123°23.804'W Curteis Point then northerly following the shoreline to the beginning point. 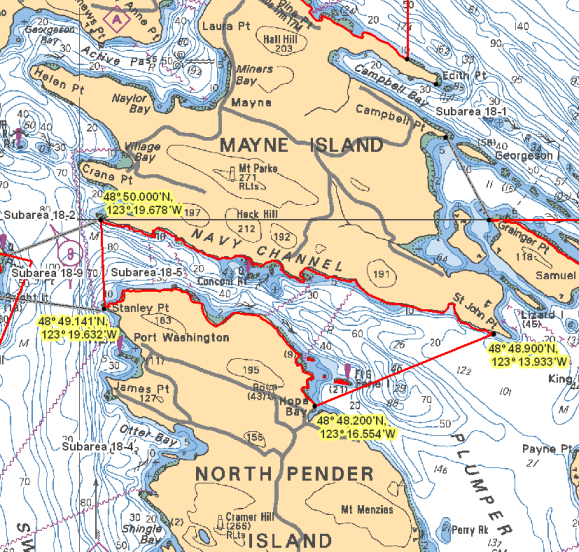 Mayne Island North Mayne_Island_North.png Those portions of Subareas 18-1 and 29-4 that lie inside a line that: begins at 48°53.163'N 123°19.250'W Cain Point then true north to 48°53.259'N 123°19.250'W Gossip Island then following the easterly shoreline of Gossip Island to 48°53.671'N 123°19.367'W Gossip Island then to 48°53.950'N 123°19.100'W in water then to 48°52.300'N 123°15.200'W in water then true south to 48°51.550'N 123°15.200'W Mayne Island, near Edith Point then northwesterly following the Mayne Island shoreline to 48°52.398'N 123°17.487'W Active Pass Light then to 48°53.099'N 123°18.362'W Gossip Shoals Light and Bell Buoy U47 then to 48°52.778'N 123°18.724'W Rip Point then northwesterly following the shoreline of Galiano Island to the beginning point. Outer Gulf Islands 1 Outer_Gulf_Islands_1.jpeg Those portions of Subareas 18-1 and 29-4 that lie inside a line that: begins at 48°54.936'N 123°19.589'W then southerly to 48°54.283'N 123°18.529'W then to 48°54.114'N 123°18.619'W then to 48°54.065'N 123°18.771'W then to 48°54.787'N 123°19.929'W then to 48°54.902'N 123°19.793'W then to the beginning point. 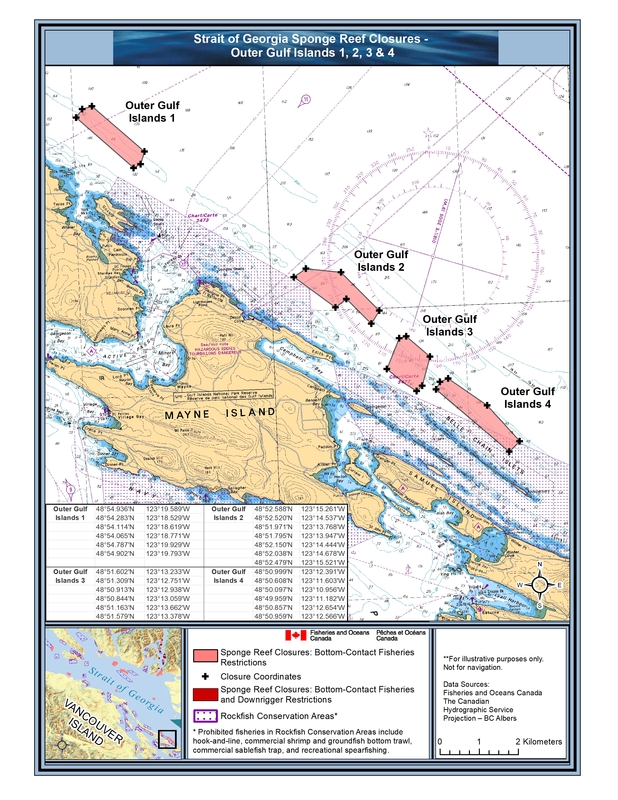 Outer Gulf Islands 2 Outer_Gulf_Islands_2.jpeg Those portions of Subareas 18-1 and 29-4 that lie inside a line that: begins at 48°52.588'N 123°15.261'W then easterly to 48°52.520'N 123°14.537'W then to 48°51.971'N 123°13.768'W then to 48°51.795'N 123°13.947'W then to 48°52.150'N 123°14.444'W then to 48°52.038'N 123°14.678'W then to 48°52.479'N 123°15.521'W then to the beginning point. 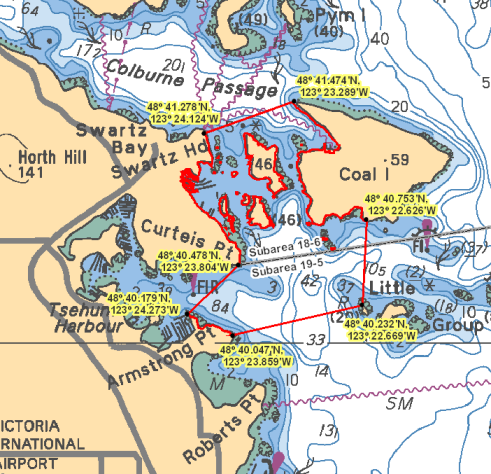 Outer Gulf Islands 3 Outer_Gulf_Islands_3.jpeg Those portions of Subareas 18-1 and 29-4 that lie inside a line that: begins at 48°51.602'N 123°13.233'W then southerly to 48°51.309'N 123°12.751'W then to 48°50.913'N 123°12.938'W then to 48°50.844'N 123°13.059'W then to 48°51.163'N 123°13.662'W then to 48°51.579'N 123°13.378'W then to the beginning point. 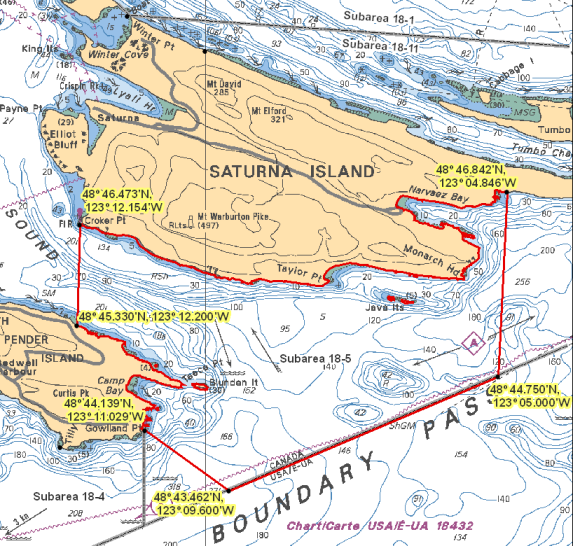 Outer Gulf Islands 4 Outer_Gulf_Islands_4.jpeg Those portions of Subareas 18-1 and 29-4 that lie inside a line that: begins at 48°50.999'N 123°12.391'W then southerly to 48°50.608'N 123°11.603'W then to 48°50.097'N 123°10.956'W then to 48°49.959'N 123°11.182'W then to 48°50.857'N 123°12.654'W then to 48°50.959'N 123°12.566'W then to the beginning point. 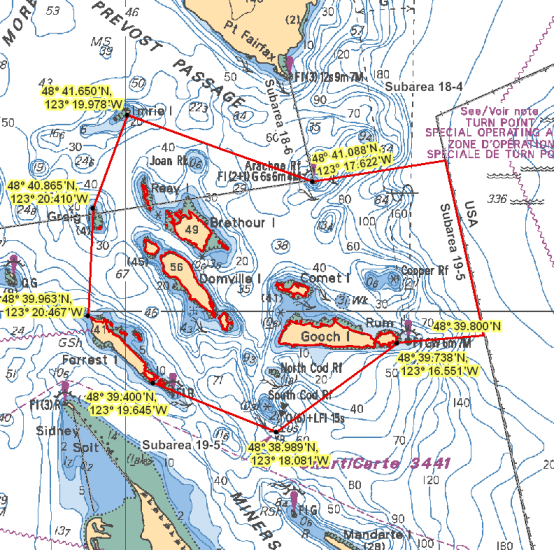 Patey Rock Patey_Rock.png Those waters of Subarea 18-7 that lie inside a line that: begins at 48°42.250'N 123°31.500'W in water then true east to 48°42.250'N 123°30.500'W in water then true south to 48°41.850'N 123°30.500'W in water then true west to 48°41.850'N 123°31.500'W in water then to the beginning point. 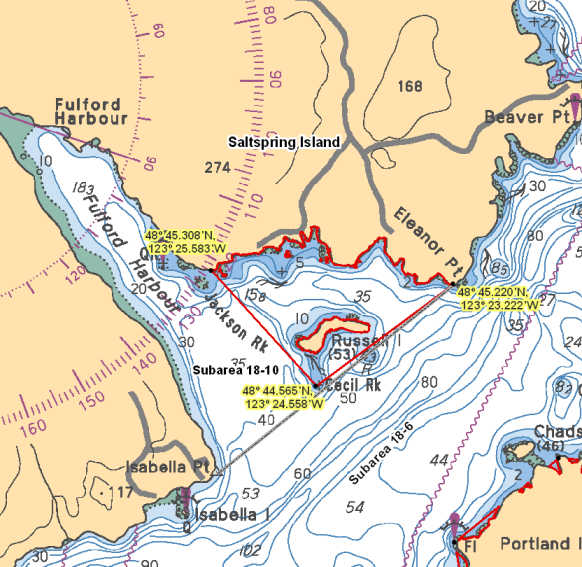 Portland Island Portland_Island.png That portion of Subarea 18-6 that lies inside a line that: begins at 48°44.100'N 123°22.200'W northern tip of Portland Island then to 48°44.012'N 123°20.404'W Canoe Rock Light then to 48°43.339'N 123°21.045'W Pellow Islets Light Buoy U15 then to 48°42.639'N 123°22.962'W Celia Reef Light Buoy U14 then to 48°43.559'N 123°23.215'W Kanaka Bluff Light then following the northwesterly shoreline of Portland Island to the beginning point. 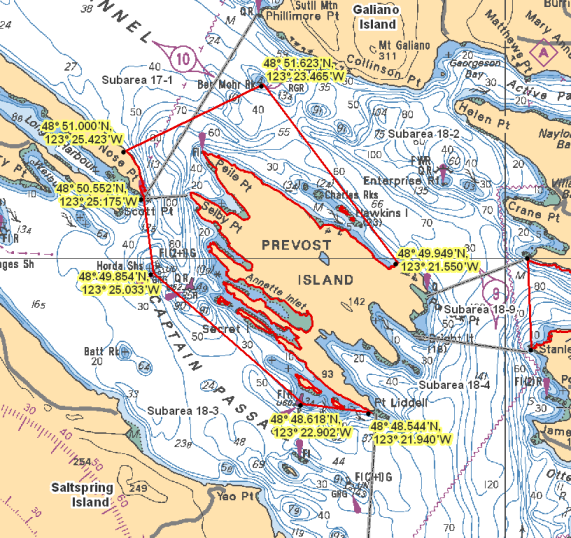 Prevost Island North Prevost_Island_North.png Those waters of Subareas 17-1, 18-2 and 18-3 that lie inside a line that: begins at 48°51.000'N 123°25.423'W Athol Peninsula then to 48°51.623'N 123°23.465'W Ben Mohr Light Buoy then to 48°49.949'N 123°21.550'W near Portlock Point then following the northwesterly shoreline of Prevost Island to 48°48.544'N 123°21.940'W Point Liddell then to 48°48.618'N 123°22.902'W Acland Islands Light Buoy then to 48°49.854'N 123°25.033'W Horda Shoals Light Buoy then to 48°50.552'N 123°25.175'W Nose Point Light then following the shoreline of Athol Peninsula to the beginning point. 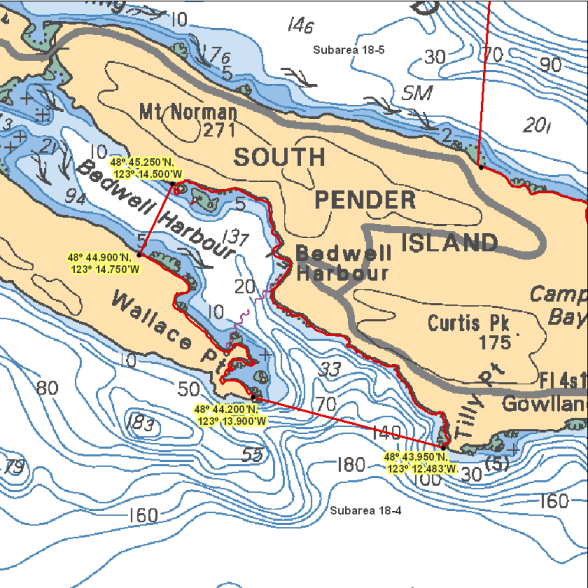 Russell Island Russell_Island.png Those waters of Subarea 18-10 that lie inside a line that: begins at 48°45.220'N 123°23.222'W Eleanor Point then to 48°44.565'N 123°24.558'W Cecil Rock then to 48°45.308'N 123°25.583'W near Jackson Rock then easterly following the shoreline to the beginning point. 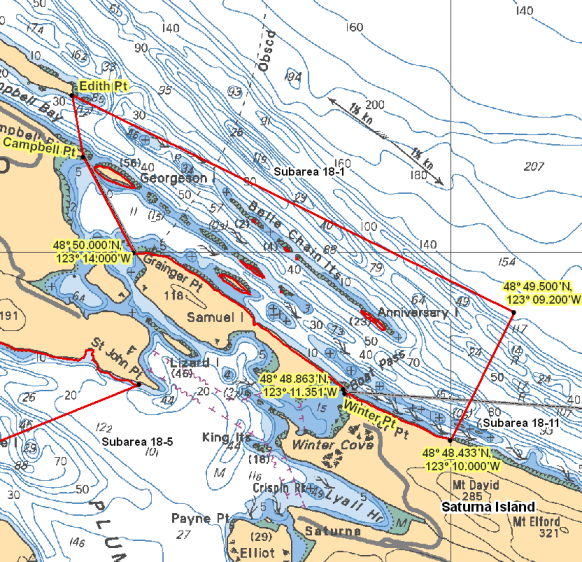 South Saturna South_Saturna.png That portion of Subarea 18-5 that lies inside a line that: begins at 48°46.842'N 123°04.846'W near Fiddlers Cove then to 48°44.750'N 123°05.000'W in water then to 48°43.462'N 123°09.600'W in water then to 48°44.139'N 123°11.029'W Gowlland Point Light then following the northerly shoreline of South Pender Island to 48°45.330'N 123°12.200'W north of Little Bay then to 48°46.473'N 123°12.154'W Croker Point Light then following the southerly shoreline of Saturna Island to the beginning point.